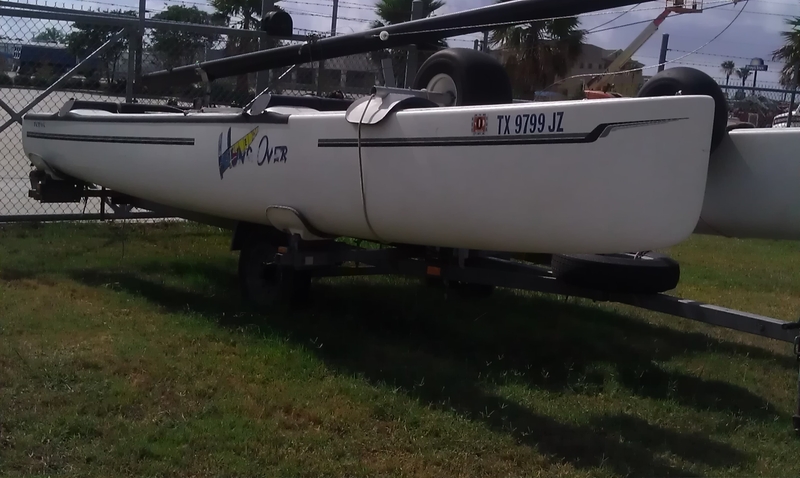 I picked up my new ride early this week it’s a 2000 Hobie Tiger thanks to the good people at KO Sailing I got it for a decent price. It needs some TLC the last owner had never sailed before and this was his first sailboat so it has a few bumps and bruises and has been neglected. The funny thing is the boat was named Hung Over and I’m sure the original owner named it that for a different reason but right now it does look hung over the tramp, lines & rigging are fried and it needs a real good cleaning and a few other repairs. I plan on taking my time and getting the boat cleaned up and everything in good working order before taking it out. ~ by Floyd on July 14, 2011.